How important are water and carbon to life on Earth? What are the main hazards generated by volcanic activity? What hazards are caused by earthquakes? Why do people choose to live in tectonically active locations? How do we measure the size of an eruption? The Volcanic Explosivity Index (see table below) is the volcanic equivalent to the Richter Scale. The VEI is used to identify the magnitude of a volcanic eruption. 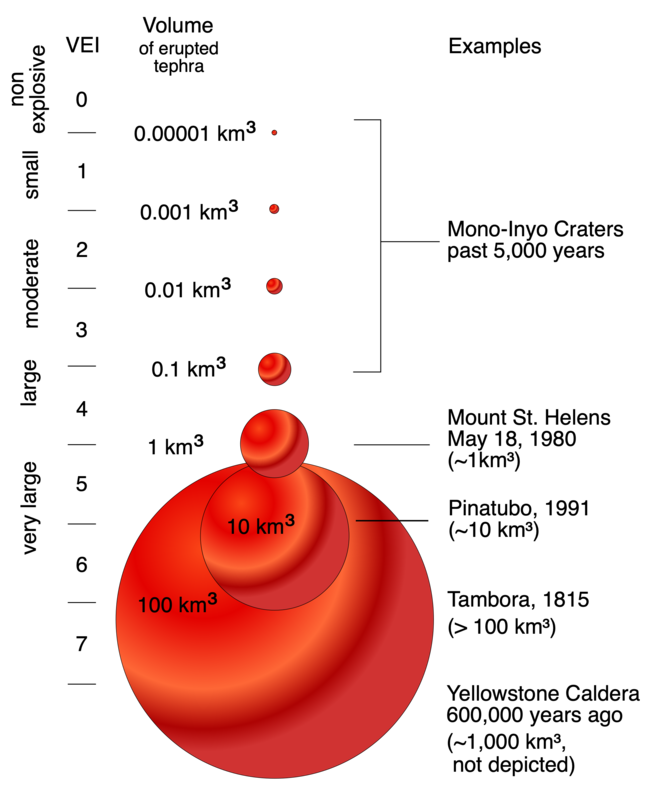 The VEI combines the magnitude and intensity into a single number of a scale of 0 (least explosive) to 8, the most explosive. Each increase is equivalent to almost a ten-fold increase in explosivity. Eruptions with small VEI numbers are far more common than those with a high VEI. Strombolian eruptions usually have a VEI of 1 or 2 whereas Plinian eruptions have a VEI of 5 or 6. The VEI is not particularly useful for effusive eruptions such as those on Hawaii. However, it is valuable in predicting the relative impacts volcanoes might have at different scales.